Riding short, fast bursts is great training but it's sometimes good to go on a longer, more relaxed ride at the weekends. And you only need one pack for both: the Halo 26 Pack. In fact, this might just be the only day pack you'll ever need, whether you're out on your bike or hanging out on the university campus. The Halo series was inspired by the Norwegian island of Senja — the best place to see the Northern Lights. The bold, colour gradient designs are inspired by this impressive natural spectacle. 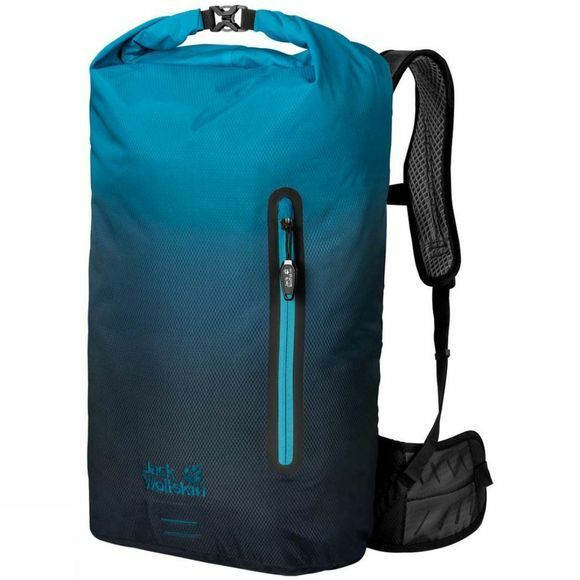 The Halo 26 Pack is the largest model in the series and has a roll-top closure system on the main compartment. Inside you'll find a pouch for your water bladder and a handy Organiser. The front pocket has enough space for your gloves, mobile phone, etc. and there's a practical fastener to attach your LED light. The Halo packs are equipped with our flexible ACS Tight back system to help keep you mobile. Because the pack sits very close to your body, you retain full control of the load - even when the pace hots up. The central air channel at the back and the air permeable padding cool your back as you move. And if you drop things down a gear and use the Halo 26 Pack as an everyday pack, you can stow the hip fins.